The Lady Okie: Date Night(s)! A few weekends ago, Jordan and I left R with Jordan's mom for a date night! 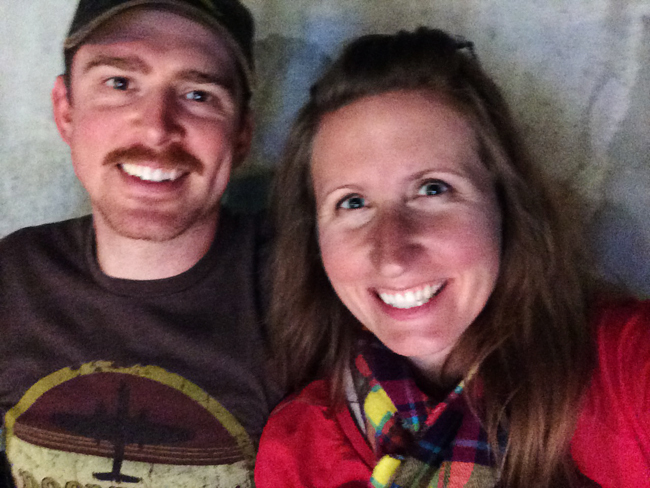 Every year we go to at least one Oklahoma City Thunder game, and it was a great first date post-baby. We sat at the very tip top of the stadium, which is typically where we end up sitting with the exception of one time when I splurged and bought us tickets in the 20th row. Usually by the time we make our way to the top, we're both out of breath and have to work through some vertigo. 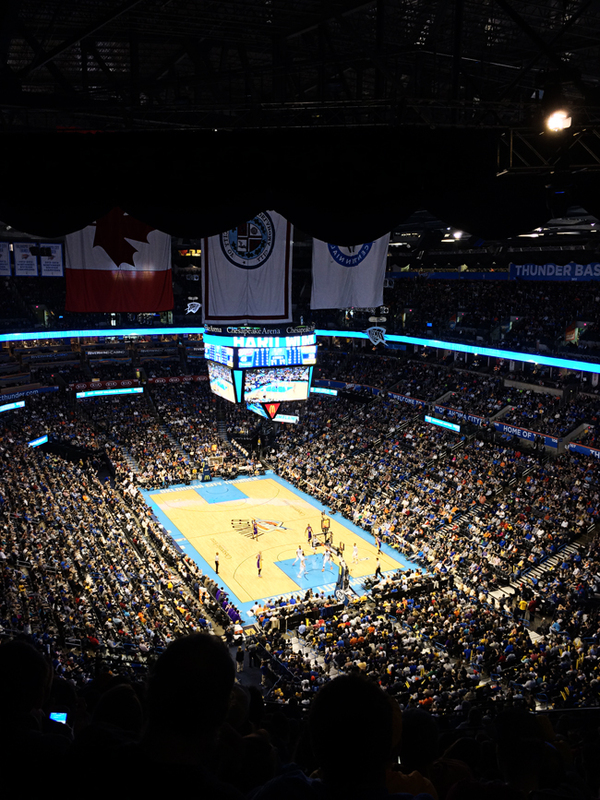 Nevertheless, it's always a fun time, and there's really not a bad seat in the house. You can't be too picky when you're cheap. Jordan's mom always does a great job watching R, so I wasn't worried about her. We left two bottles just in case (she only ended up needing one), and we thoroughly enjoyed taking some time to hang out just the two of us outside the house! Although I see why couples say they end up talking mostly about their baby even when they are alone. Not gonna lie: she's fun to talk about! So that was on a Saturday night. 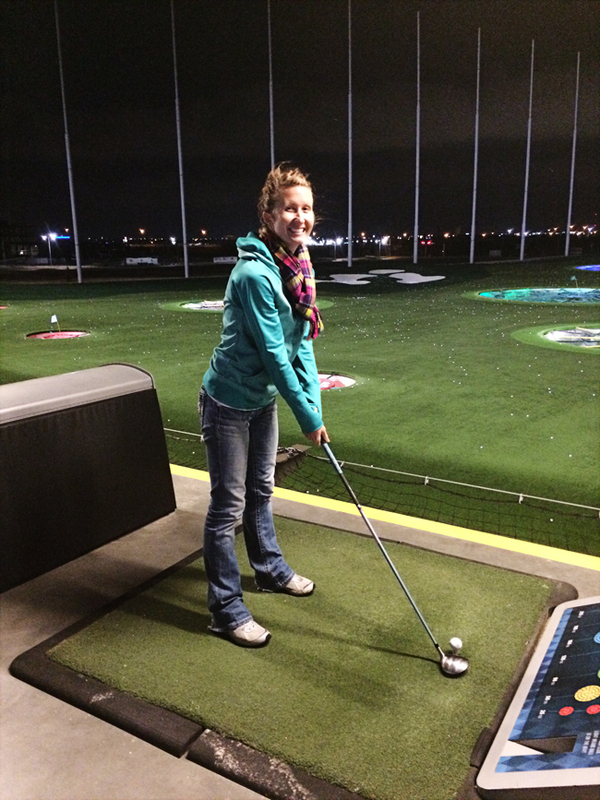 Then, at the last minute, Jordan's boss planned his company Christmas party for Sunday night... Top Golf! We were going to take R with us, but Jordan's mom said she thought it would be better if she just watched R for the evening. So that's how we unexpectedly ended up having our first two date nights back to back! Having only swung an actual golf club once in my life other than mini putt, I fully expected to be terrible. Fun fact: I'm terrible at mini putt. I'm that person who always has to fish their ball out of the water. Anyway, I was embarrassingly awful for the first game and still didn't lose, which says something about the caliber of Top Golf players we had. And THEN, I miraculously got good! Everyone was shocked, including me. I just started swinging really well and hitting the ball into the targets, and I killed my previous score, like times six. I might have missed my calling. I understand the obsession with Top Golf now. So fun! The food was good too, which surprised me. I expected it to be more about the golf and the food to be mediocre, but the food was tasty! We were really glad we didn't take R because it was super windy outside, and she would not have liked it. I'm thankful Jordan's mom was available to watch her! They live less than a mile from us, so it works out well for free babysitting. We pay them in granddaughter cuddles. That's legit, right? Jordan and I were pretty terrible about fitting in actual date nights before R came along, so I don't have high expectations for date nights now that our family is growing, but it was really fun to get out for a few things together. Top Golf was great, and we enjoyed continuing our tradition of going to a Thunder game. Date night(s) success! Glad you had a great time! Looks like fun! Date nights are so important. Looks awesome!!! Both nights look like F.U.N! I'm so incredibly jealous that you have grandparents just down the road...I think being away from both of our families has been the hardest part of parenting so far! I love date nights! Maybe even more now than before we had a kid? Although, I admit to occasionally making a list of talking points on my iphone, just in case. You know, to ensure that grown up conversation makes its way in between the kid talk. It's so nice to have grandparents close. Babysitters are expensive these days! We've done some at-home date nights too. We have been watching the Star Wars movies together after R is in bed! This is something that I am worried about that has zero logic behind it...we rarely ever go on dates, and always choose to have date nights at home. But now that Jack will be here any day, I find myself thinking, "But what if we WANT to go on date nights all of the sudden?" Yay for fun date nights!! Glad you had a chance to get out for a bit! Both sound like a great time! That's awesome you had two date nights! We've had two as well, both when my Dad came to visit. He's coming back in February and I'm counting down the days until we can go out. It's so energizing and I appreciate it SO much more now. That's fantastic! It's really nice that you were able to get out by yourselves- twice in one week! Date nights are on my goal list for the year- we only tend to go out by ourselves for our anniversary. Time to amend that! There is supposedly a Top Golf coming to our area this year or next and I look forward to trying it out! :) Glad you guys squeezed in a two-for-one kinda weekend and SO nice to have babysitters that close! I love that the two of you got time for a date night. It's so important - plus, leaving R with grandma is always amazing for all parties involved! Not that I need more convincing, but you really make me want to move back home closer to family so I can take advantage of free babysitting in the future (after you know, babies). It's a win-win. Christmas parties that involve something to do (golf!) are the best kinds of parties. And no heels required. i'm glad to hear you guys were terrible at date nights before baby because KC and I are simply not date night people lol, i guess i don't see the need for them right now. i mean, we do stuff, but i guess it's more important when you have kids. i'm glad you were able to have some fun without R and I'm sure Jordan's mom appreciated the granddaughter cuddles! I guess I will have to google 'Top Golf' because that is a new thing to me. I kind of understand date nights before kids but kind of don't because if you eat a dinner at home it is kind of a 'home date'. If you go out to eat isn't that a date? I guess there are times when Dave and I are more intentional around each other where we put our phones away, etc. SO when we have kids I'll probably be more pro-active in carving out time for the two of us. I'm glad you had a good time and I'm glad your mother-in-law gets to watch R. That sounds like a win win for both parties involved.